Friends National Limited, Has Posted A Job Advertisement For Experience Accounts & Finance Professionals. So You Can Apply For This Within 14Th Of December, 2018. Guy's Always Remember To Check Out The Official Recruitment Notification For More & Clear Understanding, It's Given Down Below. Total Number Of Vacancies → 42 Online Vacancies. Age Limit →30 Years For Account Officers/ 48 Years For Senior Officers (OBC Candidates) & 50 Years ST Candidates. Educational Qualifications →Chartered Accountant Or Cost & Management Accountant From ICAI, With 2 Years Full Time Experience (For Full Details Check Out Advertisement Below). Mode Of Examination/Selection Process →Shortlisted/Personal Interview. 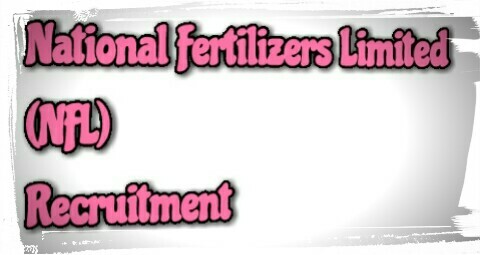 Online Application/Examination Fee →₹ 700 For The Post Account Officers & ₹1,000 For Senior Manager, Candidates Belonging To Reserved Categories Are No Need To Pay & Payment Should Made Through Demand Draft In Favour Of National Fertilizers Limited Payable At New Delhi. Last Date For Online Application Form →14th Of December, 2018. Examination Date →For National Fertilizers Limited Exam Date, Visit Official Website Below. Admit Card Download →To Download NFL Admit Card, Click Their Official Site Below. Result →NFL Recruitment Result, Click Their Official Website →Official Website. Now Enroll Yourself Down Below. All The Very Best & Do Visit Here Regularly For More Information On The Government Jobs News Alerts, Till Then Stay Safe And Blessed.